Your smartphone is your personal device. It keeps many of your personal files and data, which includes private photos, videos and messages that you wouldn’t want to be seen by anyone. But keeping these files safe from family and friends may be troublesome especially when they are checking out your phone to view or try out your downloaded applications. To keep your files safe and hidden in your phone, you may need a protected folder with a password, so no one will be able to access them without the right password. Some bad news first, this can be done on the computer, but not on smartphones. The good news? You can keep your files safe and private with an external application called KeepSafe. First search for the KeepSafe app from the Android market on your smartphone and install. When installation is completed, you will be prompted to insert your protection pin. Insert your preferred 4-digit pin. Click ‘OK’ and insert the pin again for confirmation. You will be redirected to a page where you can enable a pin reminder in case you forget it. Insert your email address to activate the email remainder, or tap on ‘No, Thanks’ to disable it. 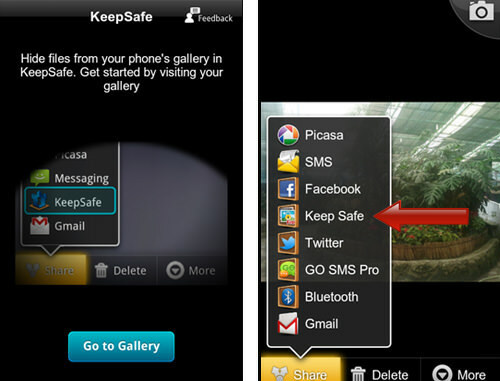 Your KeepSafe application is now ready for use, and to set your photos and videos to be kept safe with KeepSafe, go to your smartphone’s gallery, select any photo or video, then click on the ‘Share’ button. From the selection, choose ‘Keep safe’. And that’s it, whenever you add your photos or videos to your KeepSafe vault, no one will be able to view them without providing the pin you have set earlier. 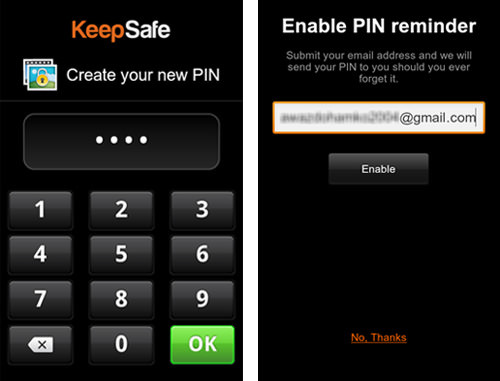 To view these protected files, simply open up the KeepSafe application and enter your pin. To unhide your photos or videos from KeepSafe, open your KeepSafe Gallery, select any photo or video you want to unhide, long-press the item until a pop-up window appears with options, then click on ‘unhide’. Once on ‘unhide’ mode, your picture may not appear on your public gallery immediately. If this happens, reboot your Android so it can re-index your gallery. This may not be the only solution for you to keep your files and data safe on your Android smartphones, but it definitely helps a lot. Now you don’t have to worry of any files being exposed to anyone by accident.